At Humphrey Manlift, we believe in safety first. As part of our continued efforts to promote the safe use of a manlift, we have developed several caution stickers to be placed directly on the manlift as a reminder of important safety practices. We are providing these stickers FREE of CHARGE to all those who own a manlift. 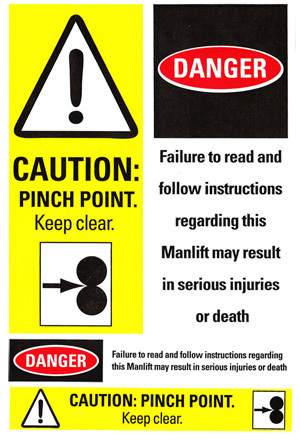 To get manlift safety stickers sent to you, please fill out our online form below, or call us directly at 507-334-6193. Download Safety Sticker Placement Instuctions.